HumanLifeMatters: WHEN DOES A HUMAN LIFE BEGIN? WHEN DOES THE INHUMANITY OF ABORTION END? WHEN DOES A HUMAN LIFE BEGIN? WHEN DOES THE INHUMANITY OF ABORTION END? A new human being begins when sperm penetrates egg. This is not a matter of opinion or religious contention. It is a biological fact. It has also been scientifically established that human life is a continuum from conception to natural death. Whether life in utero is considered a person is legal question. To deny an unborn child his/her humanity and personhood is prejudice, bigotry and sophistry. There is institutionalized bigotry in Canada against unwanted or inconvenient pre-born children. Based on zero scientific evidence Canada's Criminal Code states that the unborn child is not a human being until it is born. fabric of society decades after abortion was legalized? In 2000, Former Canadian Prime Minister Jean Chretien told a coven crowd of chanting, cheering Liberal feminists, "We have peace in Canada on the question of abortion." That was not true. The feminists were cheering a lie -- like they have cheered so many other lies. People started edging toward the exits in case his pants caught on fire. 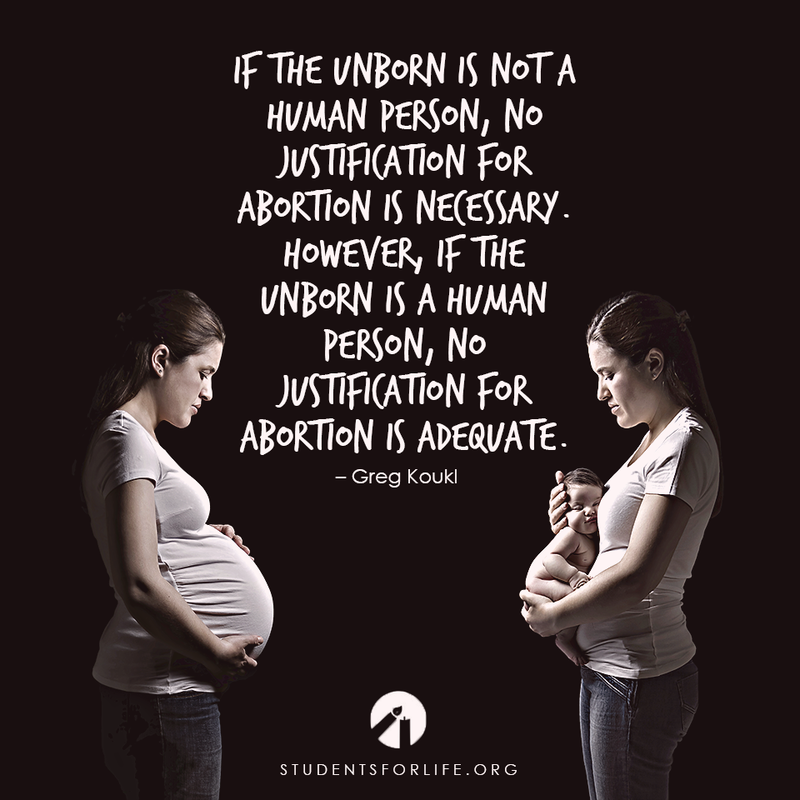 Regardless of what any law or legislature may say, the unborn child is still a human being. Not only does biology and medical science tell us the unborn child is a human being -- conscience does too. 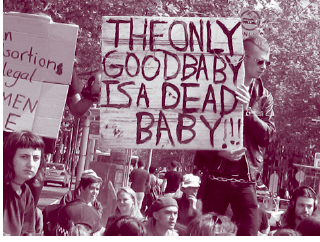 morality that excludes any responsibility to the unborn child. Their chants and screams, bullhorns and outrageous signs are not only meant to shock and silence pro-Life voices but also silence their internal voice of conscience that contradicts them. In 2017, abortion advocates and their allies continue to try and justify abortion. But why? 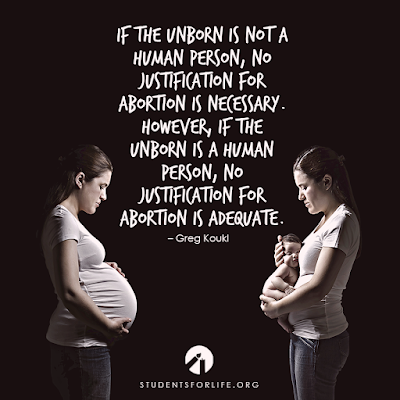 Like the poster at the top of this post says, "If the unborn is not a person then no justification of abortion is necessary. ..." If people did not instinctively know deep within their heart of hearts that abortion is wrong, why would they try to defend or justify it year after year, decade after decade?! 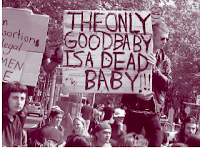 Abortion continues to fester in individual consciences and the collective consciousness of America and Canada. 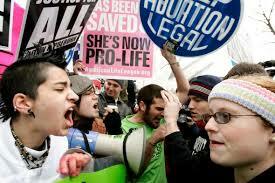 The energy of protests and howling against the pro-Life message proves it! Yes, methinks they protest to much. Everyone knows instinctively -- at some deep and original human level -- that abortion destroys a innocent developing life, and that it is a betrayal of the youngest most defenceless members of the Human Family. Abortion ideologues can't get abortion widely accepted so they force it and enforce their will. The Current Prime Minister, Justin Trudeau, would not sign nomination papers of Liberal candidates for Parliament unless they supported abortion. In the U.S., Howard Dean, Governor of Vermont and former Chair of the Democratic National Committee, espouses that all members of the Democratic party members must be supporters of abortion. 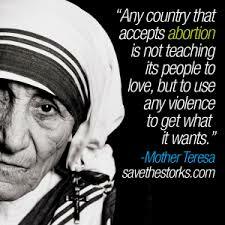 There was no peace on the question of abortion then and there still is no peace about it. Mother Teresa said, " The greatest destroyer of peace today is the crime against the innocent unborn child." There can only be social peace and acceptance of abortion when the last human conscience is seared and silent and as cold as death. 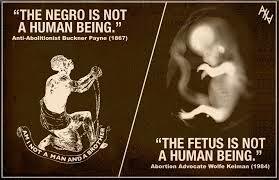 Abortion is as abhorrent as slavery. People may vigorously deny this, but the denial rings hollow. The more adamant the denial the more hollow the ring. If a day comes when abortion ceases to haunt and taunt people's consciences, it will be a terrible sign that hope for humanity is gone. It will be like hell on earth for the weakest and most vulnerable of humanity. The only thing that can save us now is a new Christian awakening and revival.